Glucose is the main source of the body’s energy, and low glucose or blood sugar results in hypoglycemia. Hypoglycemia is most commonly associated with the treatment of diabetes, but many rare conditions that can lead to Hypoglycemia too. But unlike fever, malaria or STDs, hypoglycemia is not a disease, but only indicates an underlying health problem. If you want to know if your child is suffering from hypoglycemia, you should know what's normal and what's not. In general, the normal levels range from somewhere between 70 to 110 mg/dL. However, you always need to talk to your child’s doctor beforehand to know the precise range of your child’s blood sugar levels because that figure fluctuates from child to child. Of course, there are many medical conditions that have similar symptoms, which is why you need to get the child’s blood sugar level tested to know what exactly is the cause behind such symptoms. Your child not only has diabetes or always gets hypoglycemia, but also suffers from severe signs of hypoglycemia or unconsciousness. 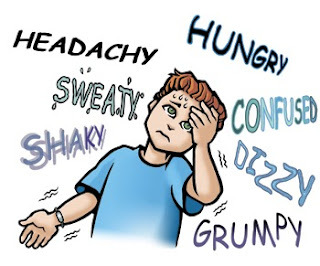 What Causes Hypoglycemia in Children? Children that suffer from diabetes have to constantly lower their blood sugar by taking insulin shots. However, an excessive use of insulin can result in hypoglycemia. With diabetes, exercising too much or eating too little can also lead to low blood sugar levels, so take care of your children’s activities and monitor regularly to ensure they have normal blood sugar levels. Insulin overproduction: Sometimes genetic anomalies in metabolism can lead to hypoglycemia in children. In other (majority) cases, abnormal growth of the beta cells in the pancreas, which is responsible for secretion of insulin, can lead to hyperinsulinism, which is known in the lay man’s terms as overproduction of insulin. Hormone deficiencies: Our body has hormones, like glucagon, T3 and T4, which regulate glucose production, but certain pituitary gland and adrenal gland disorders lead to reduced production of the said hormones, in which cases hypoglycemia occurs. Keep in mind that compared to adults, children are more susceptible if they have these disorders. Ketotic hypoglycemia: A rare but severe occurrence, ketotic hypoglycemia leads to low blood sugar levels in children when they fast for some time due to illness or other causes. With ketotic hypoglycemia, children's bodies can't store enough carbohydrates because its storage can be depleted easily. If this happens, the body has to break fats into usable carbs to meet energy needs, but this process produces a byproduct – ketones. This condition can cause irritability, sweating, low blood pressure, coma or even loss of consciousness. Reactive hypoglycemia: Sometimes, the pancreas are tricked into producing more insulin for a meal that it thinks is larger than actually consumed, which often happens to meals rich in carbohydrates. In these cases, the child’s blood glucose drops suddenly after the meal due to the excessive insulin. Hypoglycemia in the newborn: Neonatal hypoglycemia is a very serious and sadly very common problem that an astoundingly high number of term and preterm infants face. This can be caused by excessive insulin in the blood, body not producing enough glucose, or baby lacking of enough foods to keep glucose level up. And now that your child has consumed one of the items mentioned above, wait for 15 minutes and then check his blood sugar levels. If it’s less than the normal limit, indulge in another drink or food. Repeat the process till your child hits his normal sugar levels. In this cases, your child needs to be a on a high-protein and carbohydrate rich diet where they need to be fed frequently. Foods rich in carbohydrate include rice, cereal and bread, while foods rich in protein include eggs, nuts and soy milk. As for hyperinsulinism, drugs like diazoxide may be used to reduce the overproduction of insulin. If that fails, the source of the insulin production might need to be removed surgically. Besides, physical exercise not only encourages weight loss and a healthier lifestyle, but also helps improve insulin sensitivity and soothes signs of low blood sugar. The newborn is given a source of glucose that acts quickly, which may include things as simple as an early feeding of baby formula or a mixture of glucose and water. In some cases, intravenous methods may be used to supply the body with glucose. In such cases, doctors will keep a close tab on baby's blood sugar level to ensure it turns to and stays normal. Ask your doctor to adjust the dosage or replace medication if it is the cause behind the hypoglycemia in children. As already mentioned above, sometimes the child’s sugar levels can drop right after meals. In such a case, change the diet. Eat frequent, small meals during the day and make sure you avoid sugary foods. Get the pancreas checked for tumors. If there is an abnormal growth, it can easily be removed by surgery.